Fold suede lace in half and wrap bottom loop around the TierraCast 1-inch Hammertone Ring, bringing the two loose ends through the loop attaching it to the ring. Wrap 24 gauge bronze wire around the right side of the ring 3 times, starting next to the suede lace. Add one bead art. 5328 4mm purple velvet from the Swarovski crystal assortment. Wrap beaded wire around ring and wrap plain wire around one more time. Add another Swarovski bead art. 5328 to brass wire and repeat wrapping beaded wire and plain covering just a third of it until you have 5 beads attached to the ring. Wrap plain wire around ring 3 more times and cut off remaining wire. Attach the beaded Hammertone Ring to the TierraCast 1-1/4 inch Radiant Ring: Start by wrapping the brass wire around the 1-1/4 inch Radiant Ring 3 times. Add the 1-inch Hammertone Ring and continue wrapping the two rings together. Wrap the brass wire around the two rings 7 times then continue to wrap the other side of just the 1-1/4 inch Radiant Ring 3 more times. Cut off remaining wire. Attach the Swarovski filigree art. 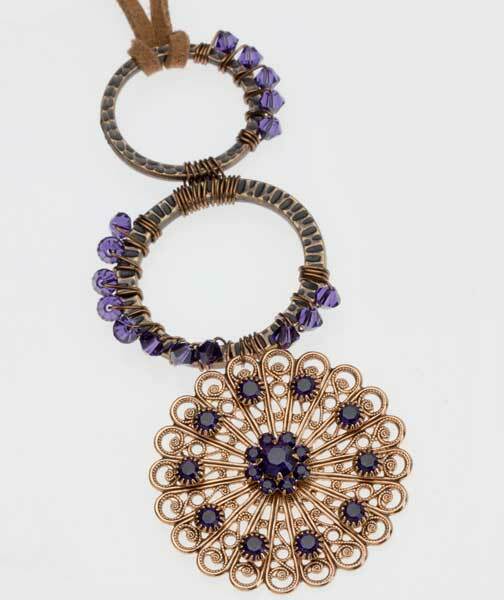 62010 to the bottom of the 1-1/4 inch Radiant Ring by wrapping the brass wire through one of the loops in the filigree and the Radiant Ring 3 or 4 times.